During the past few years, I have been fortunate to have been to Southern Africa three times including visits to both South Africa and Botswana. These visits have been varied from visits based around Cape Town including the hike up Table Mountain, a quick visit to Karoo where we saw and photographed some good species. Sue and myself then spent 10 days visiting the Morami Game reserve in Botswana were we had some great sightings of a dozen or so mammal species and over 100 bird species. More recently we spent three weeks touring the South West coast of South Africa including from Cape Town along the coast to Port Elizabeth. Africa is undoubtedly one of the greatest wildlife destinations on earth and I plan to return again. Elephant and Rhino, two of the classic species of African animal. 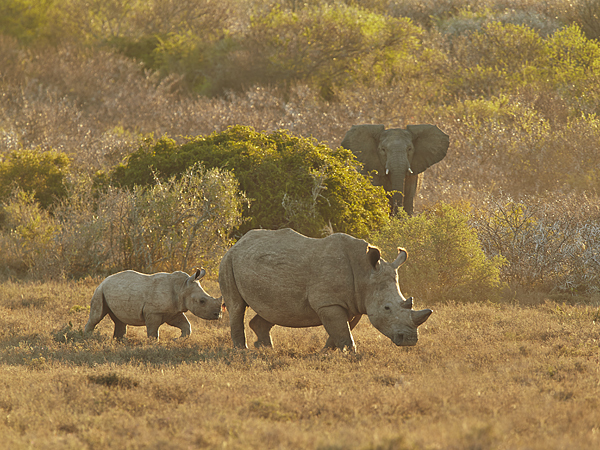 It is crazy that, unfortunately both species are still being poached and numbers are seriously decreasing. photo taken in the Eastern Cape.